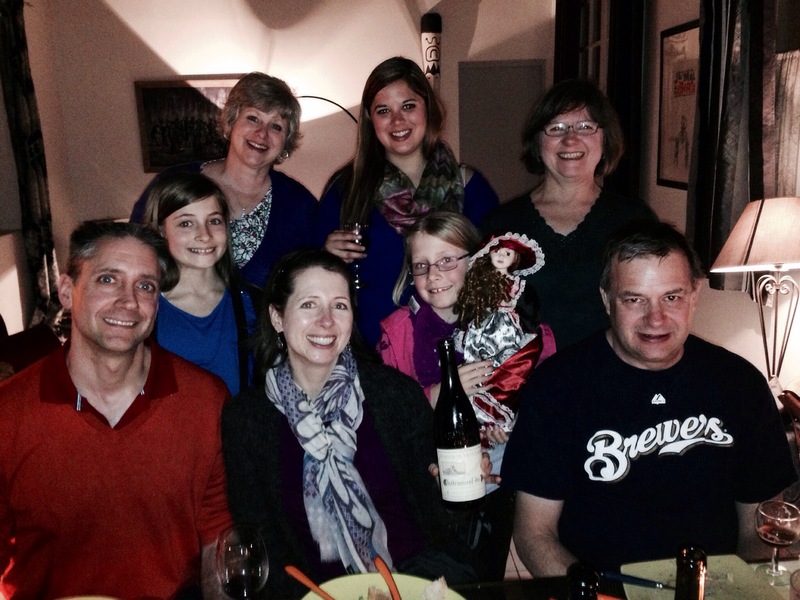 This past week, the 8th week of our France experience, our DD Angela and family visited us in Avignon. 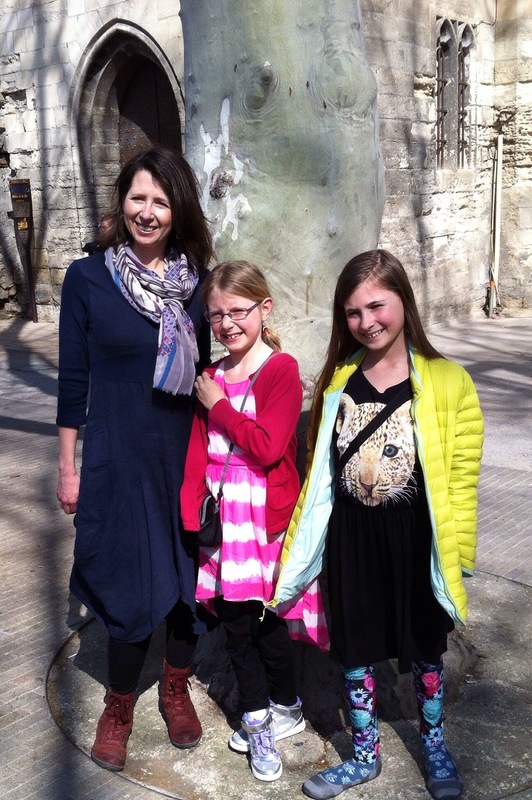 What fun we have had, visiting the sites and simply experiencing Avignon. Kevin’s sister, BIL and niece were also here for the week and stayed in a nearby apt. Angela celebrated her birthday, a memorable one for sure, with family and a bottle of Chateaunauf de Pape from her SIL and brother. They left it for her when they departed several weeks ago. Mira and Cait wanted to buy some “French fashion” while they were here, as did Angela. Size 7-14 clothing is a bit difficult to find but at their favorite H&M they each found fashion galore. Mira got floral leggings and a black tunic, and Cate bought glittery high tops and a dress. As I’ve mentioned in previous posts, the markets have been a great source for many types of dry goods and fashion is no exception. 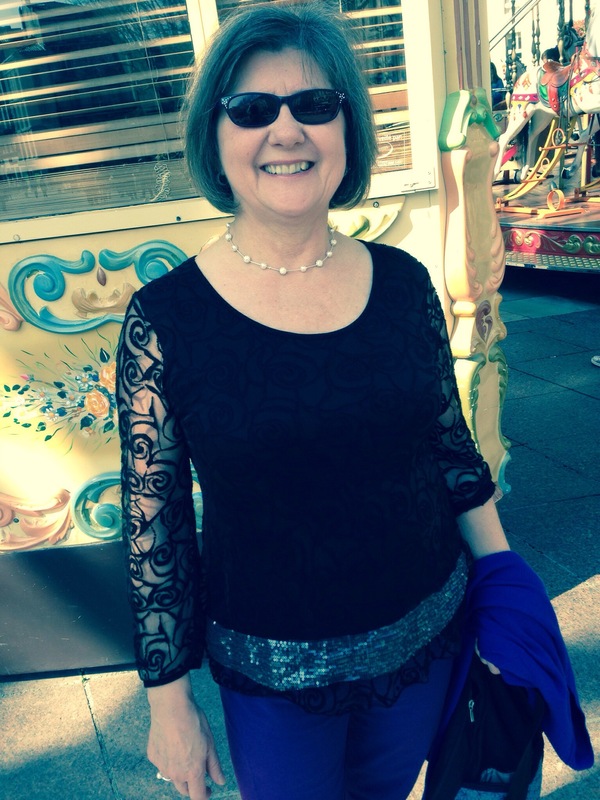 Angela found a beautifully styled cotton knit and woven linen dress with a pieced skirt. You can bet I’ll be copying this pattern. As seen the the photo, the sleeves, a front panel and back are ribbed knit while the remainder is linen. 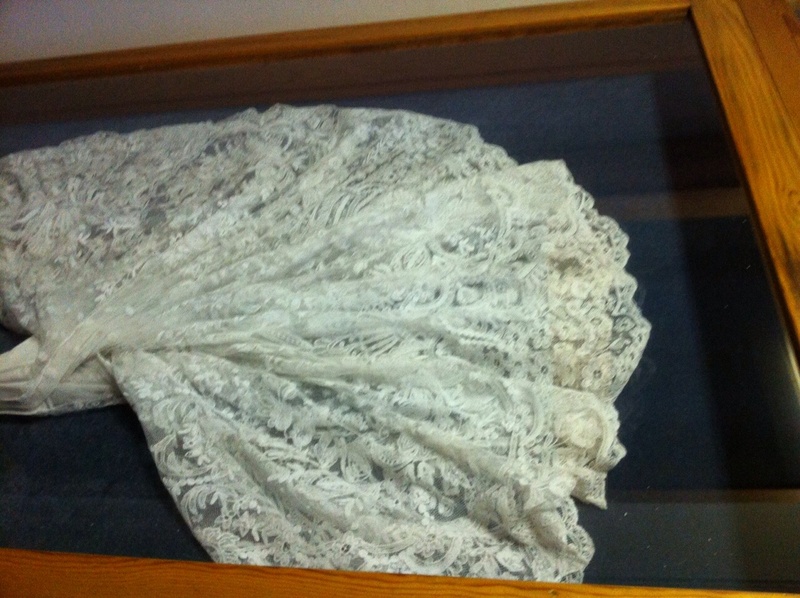 Mira and I found a lace top with the split back, a common style seen in French clothing stores. Mira loved it so much that she asked if I could sew one for her. For €18 I purchased the top and although I love it, I will likely take it apart, resize it and surprise her for her birthday. Of course I will also copy the style using a TNT pattern. Stay tuned for that post. By now it’s no surprise that Kevin and I love European markets. 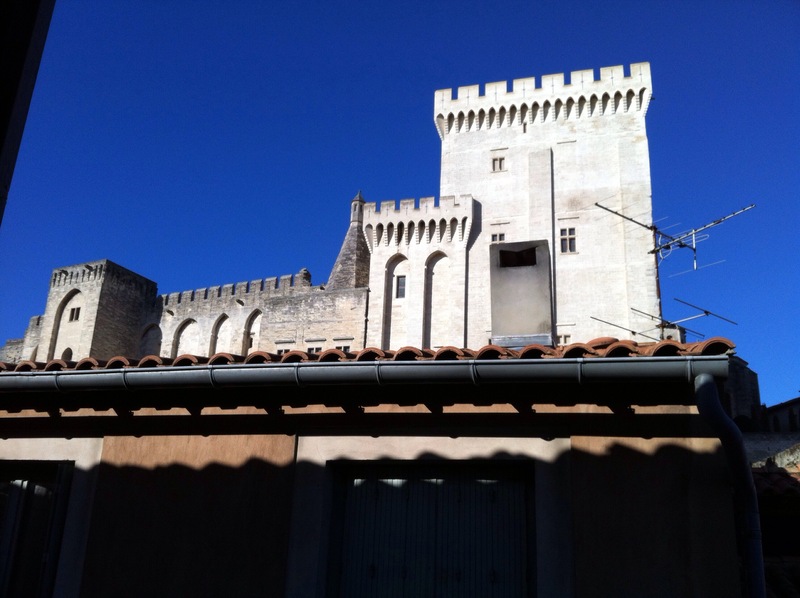 This week our DSIL and BIL visited us, so we had to take them to two of our favorite markets – Arles and L’Isle Sur la Sorgue. 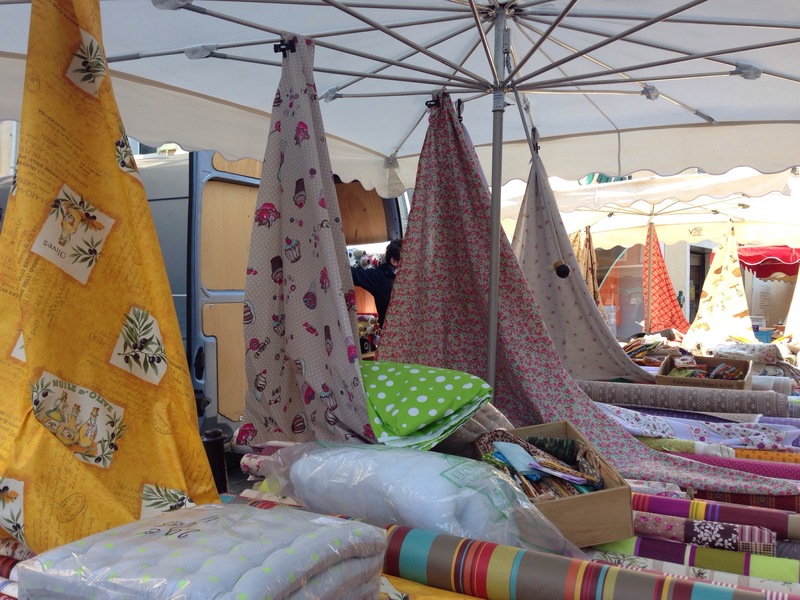 Both had lots of fabric vendors with fabrics of every type. Oh, darn, how did that photo of our new GD, Genevieve, get into this post? 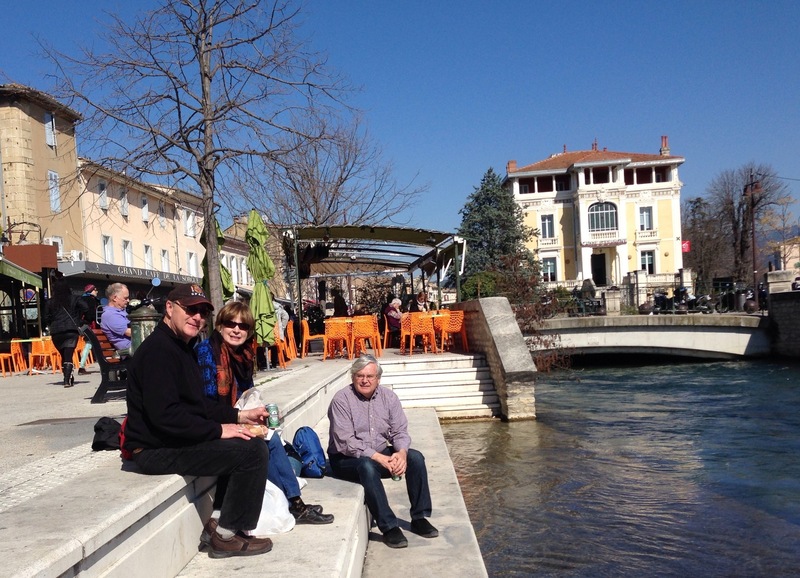 After all that shopping we had a picnic on the canal in l’Isle Sur la Sorgue. 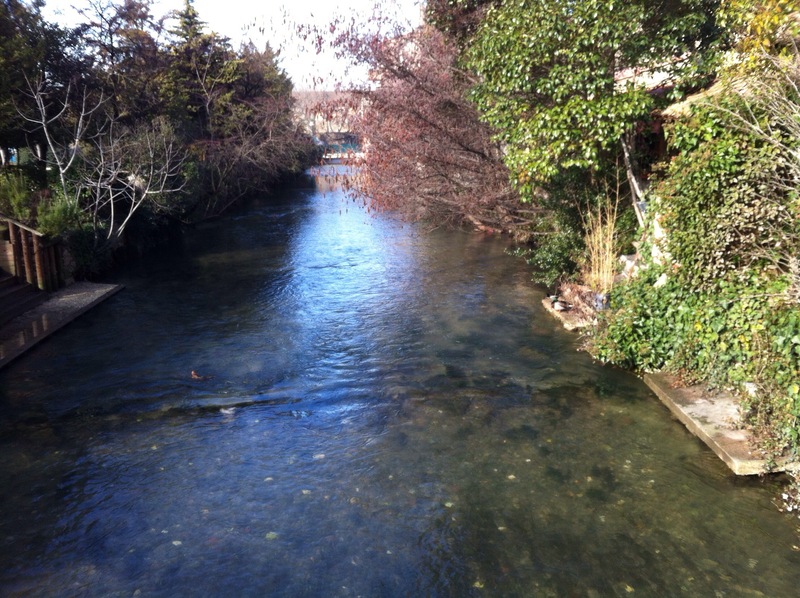 Last Sunday it was Spring in Provence, so we took a short bus ride to the gorgeous little L’Isle Sur la Sorgue, which like all Provincial towns, can clearly be classified as an antique. With it’s many canals and water wheels, some have called it the Venice of France. 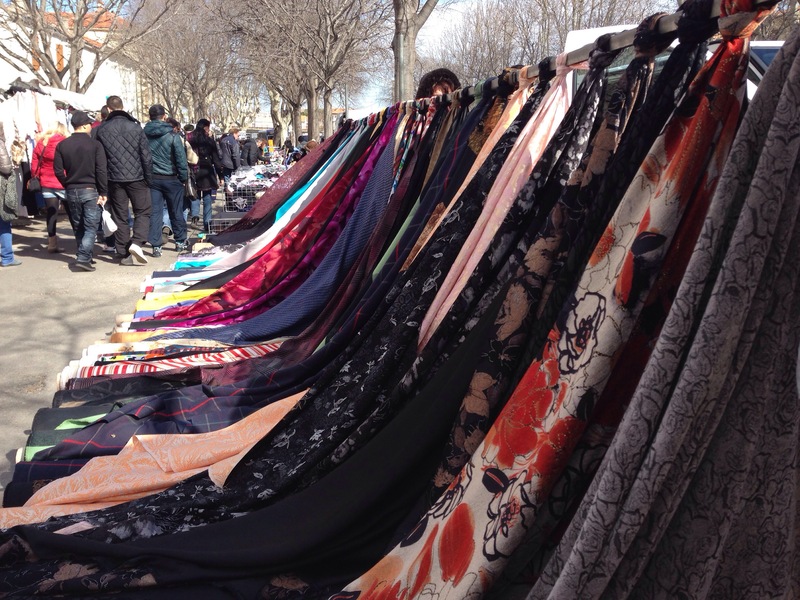 I’ve previously referenced the tradition of town markets but this Sunday market was incredible – not only meat, fish, olives, cheese and other delicious things to eat but also it had a huge number of vendors with every possible type of fashionable clothing. 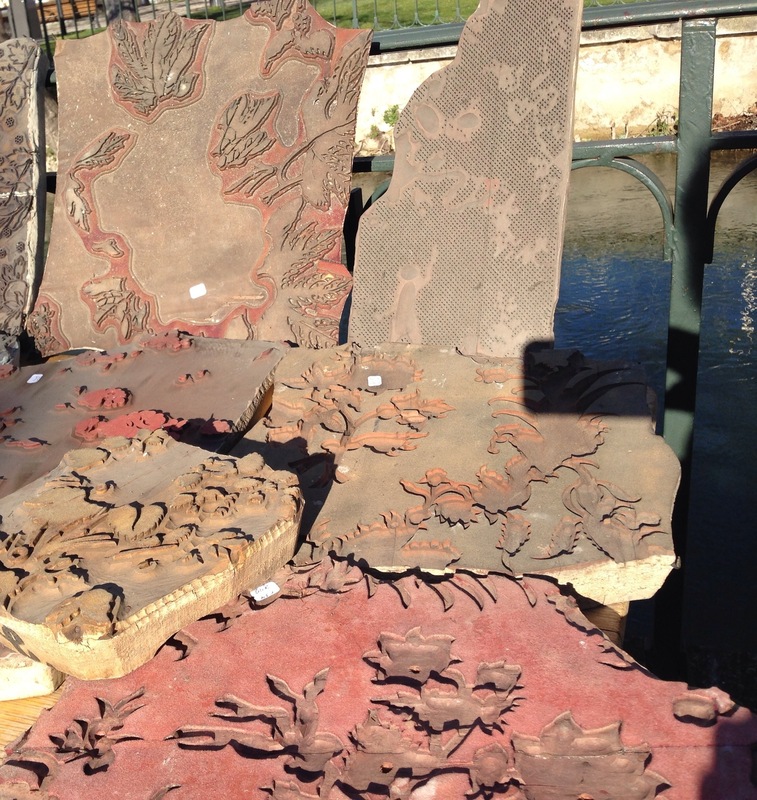 In addition there was a large antique market. 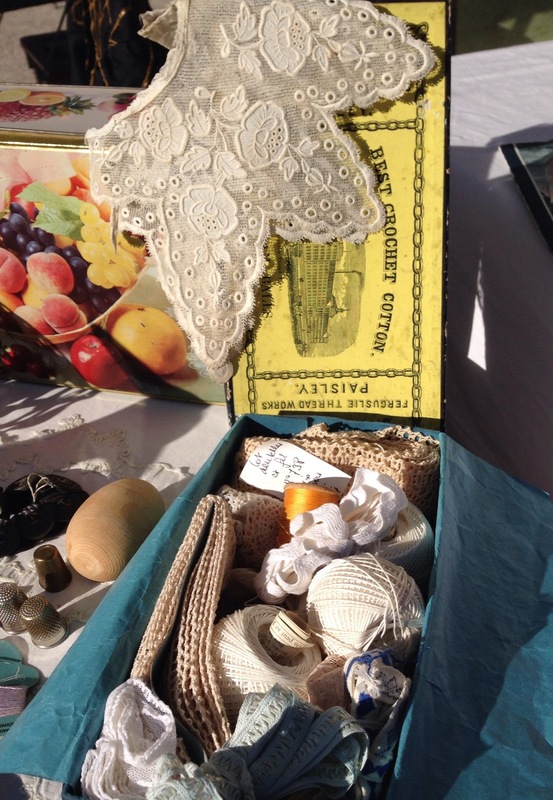 Unlike most antique markets, this one had numerous sellers with antique sewing supplies. 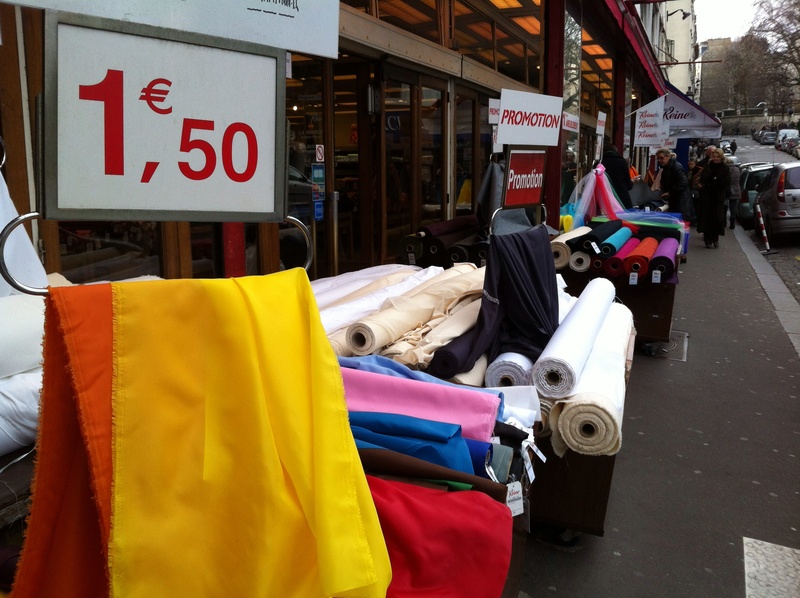 While I wasn’t in the market for these items, they gave me a glimpse of France’s lost sewing industry. Here’s a look at some of the lovely items. 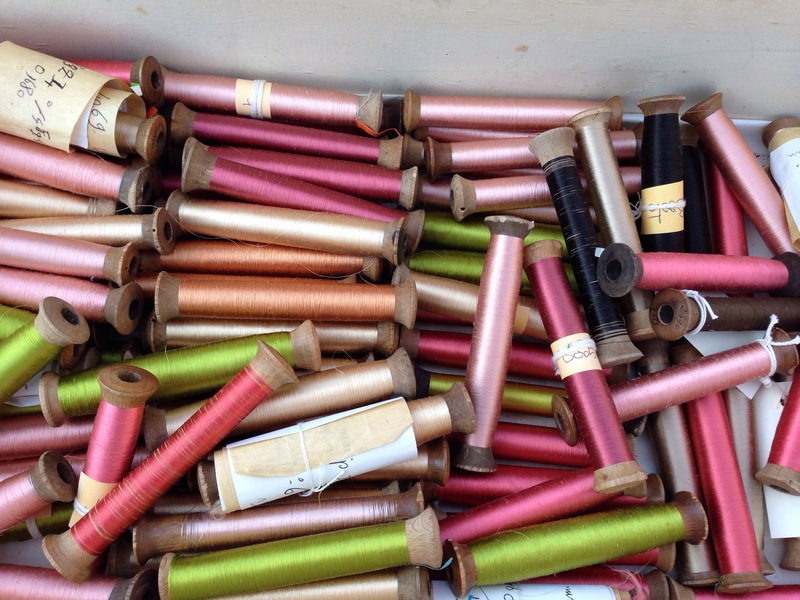 From top down; shiny thread bobbins (rayon? 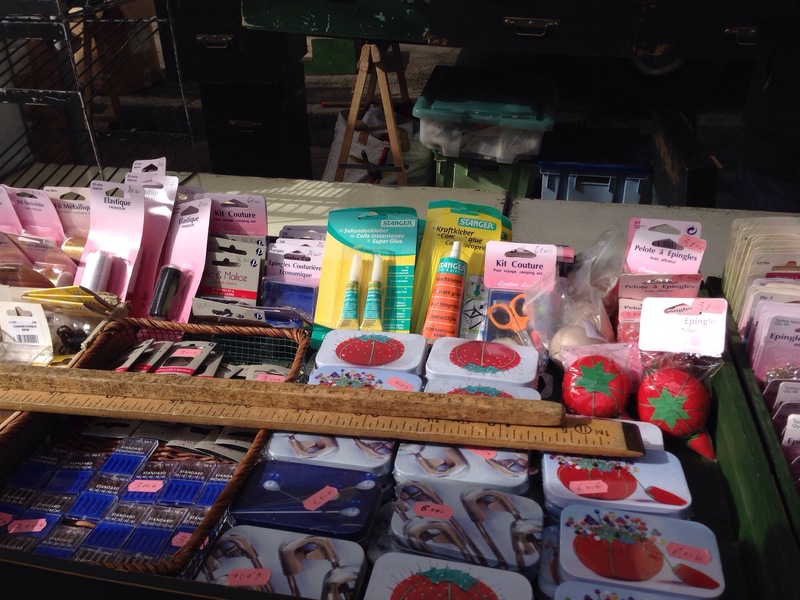 ), huge wood print blocks, cording and miscellaneous. Enjoy this look into the past. You may know about the amazing European tradition of holding markets in small town. We have visited quite a number of these markets, which are the source for fresh fruits, vegetables and meat, but also the place to buy sewing notions and some fabric. 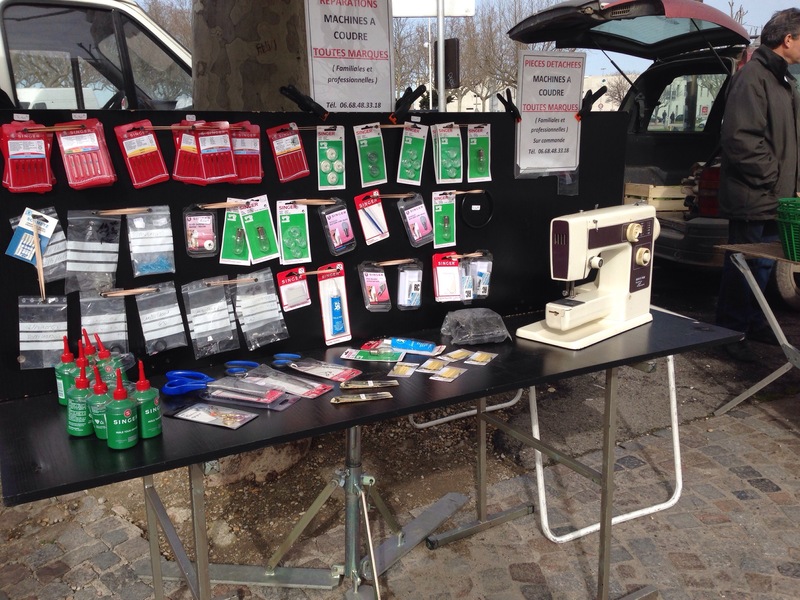 At the Arles market there’s even a sewing machine repair man (above picture). Some vendors have notions. 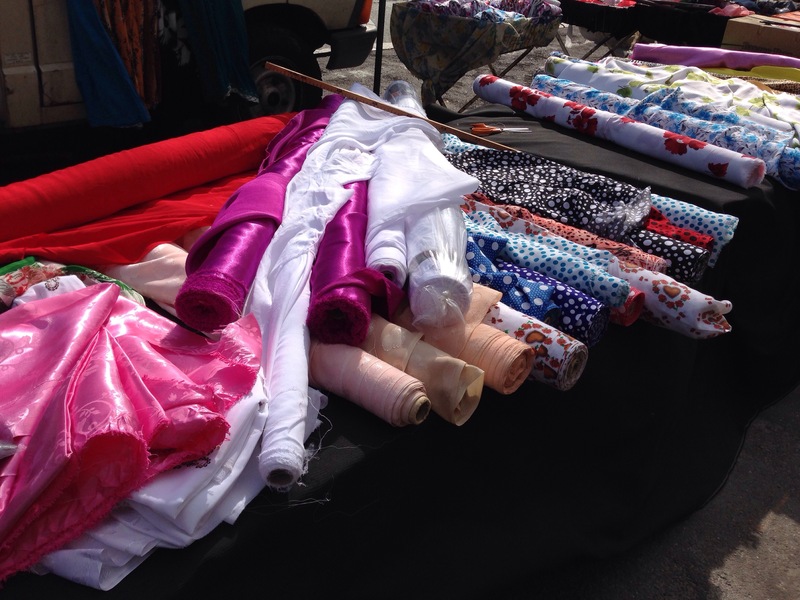 Fabric is also sold in the local markets. 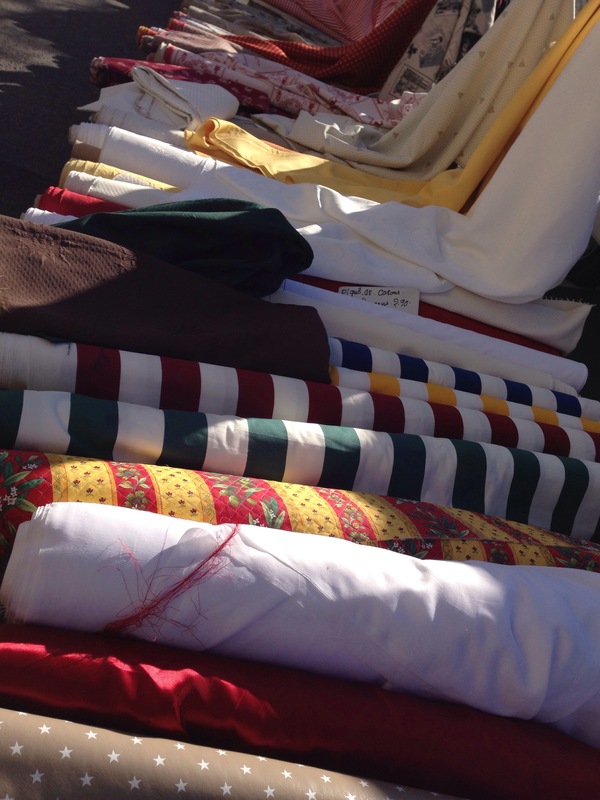 Vendors have a van loaded with rolls of fabric, which are unloaded on market days. 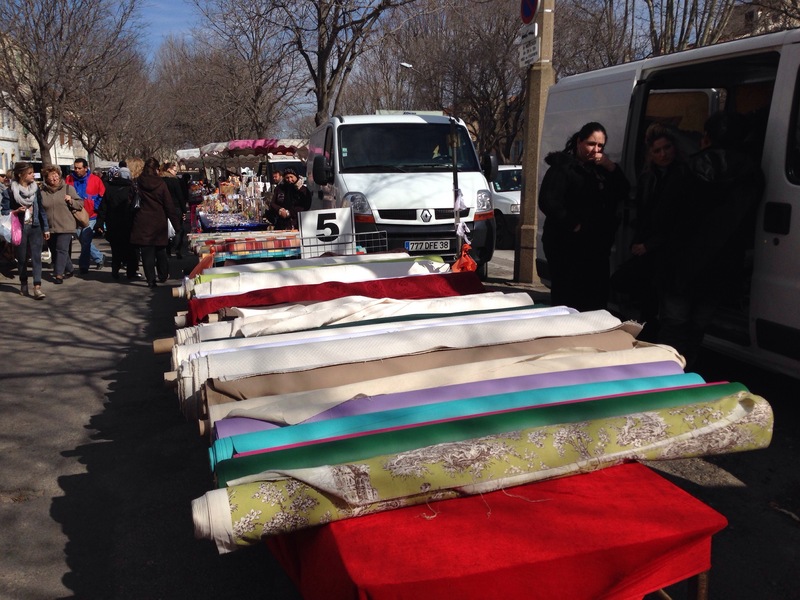 The vendors of course, have a limited supply of fabric and most is home decorator fabric. 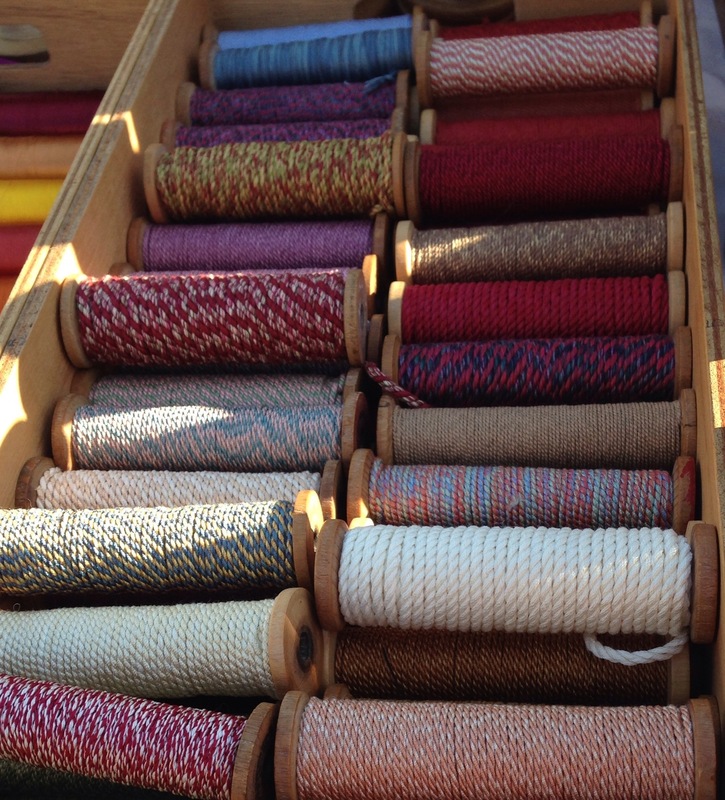 As far as I can tell, the sources for fabric in Rural France, just like in the US. What a sad situation for home sewists. While it’s great that there still is a fabric source, it’s less than ideal. What’s a sewist to do? In the past I have posted about a “safe travel pocket as an option for dissuading those pesky pick-pocketers whose life skill is to victimize travelers. Since we have twice been the victims of thugs; once pick pocketed getting onto a bus and once held up at gunpoint, we are probably more conscious of this travel risk than some others. The resulting emotional pain can easily ruin a vacation and it’s associated budget. Several years ago we began to use the internal security pocket explained in the aforementioned post along with a money belt. It worked well in that it made theft extraordinarily difficult, however Kevin complained that he still needed to carry money in a pocket. To address this we came up with the solution described in this post. It’s a secret zipper-access pocket behind the existing side-entry front pocket of pants or jeans, and Kevin loves it. For those of you who aren’t in love with your sewing machine, do not fear. This is a hand-sewn pocket. Here’s a photo of the final product and then a tutorial. Notions: 7″ zipper, 10 x 10 fabric scrap, straight pins, needle and thread. 2. Draw a line where you want to place the zipper, approximately six inches long. 3. Turn the pants inside out to check the placement. Now is the time to make adjustments. 4. Cut the pocket on the line. Reminder – the part of the pocket which faces the leg. 5. 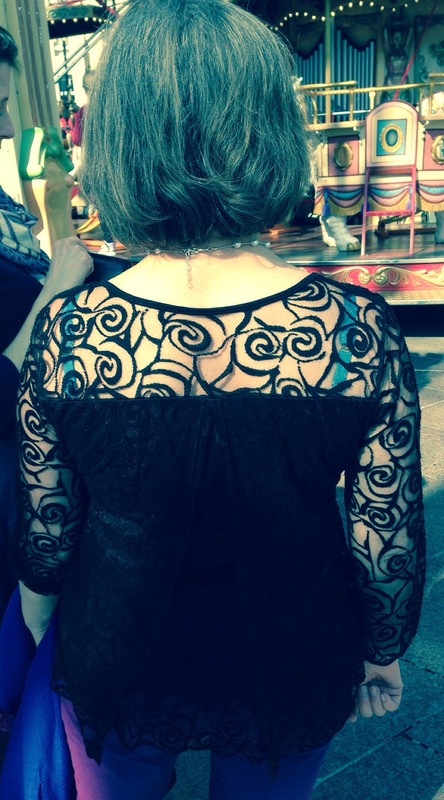 Pin the cut edges to the back of the zipper so when stitched it looks like the following photo. 6. Using a back stitch, stitch the zipper to the pocket, securing the ends well. 7. Cut off end of zipper if too long. Note: You now have nothing more than a zipper sewn to the existing pocket. 8. 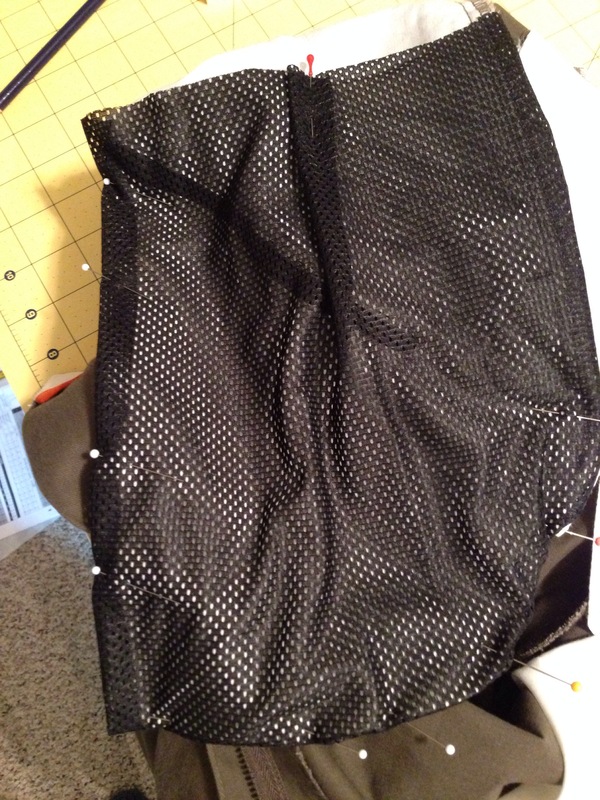 For the security pocket, using the pants pocket as a pattern, cut a piece of fabric ¾” larger than the pocket ( in this example I used black mesh). 9. 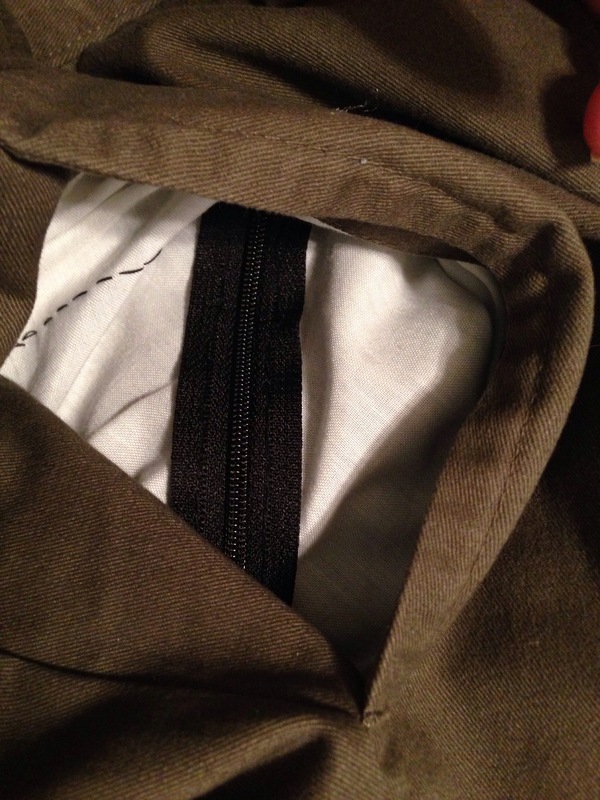 Fold seam edges under and pin fabric to the back side of the pants pocket. 10. Using a back stitch, sew to pocket sides and bottom. 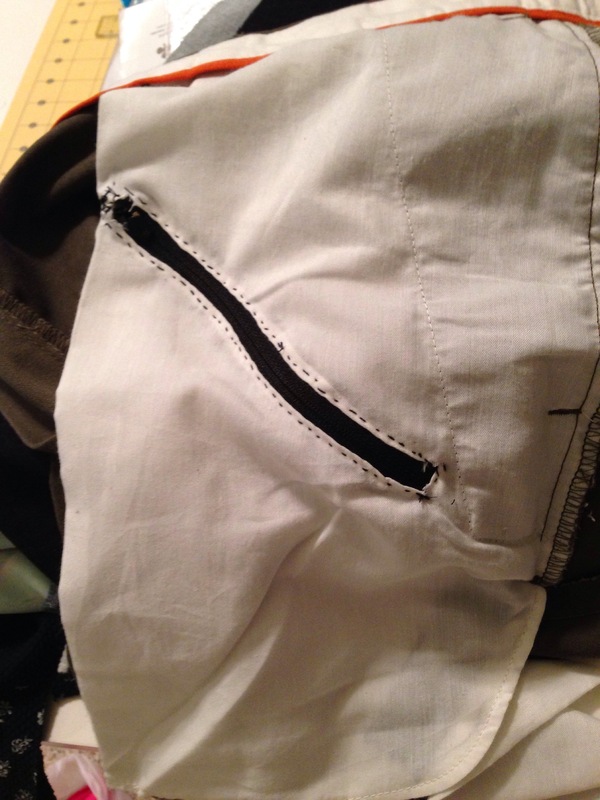 For the top of the security pocket, sew several inches from the waistband. This may vary with the type of pocket. It should look something like this. 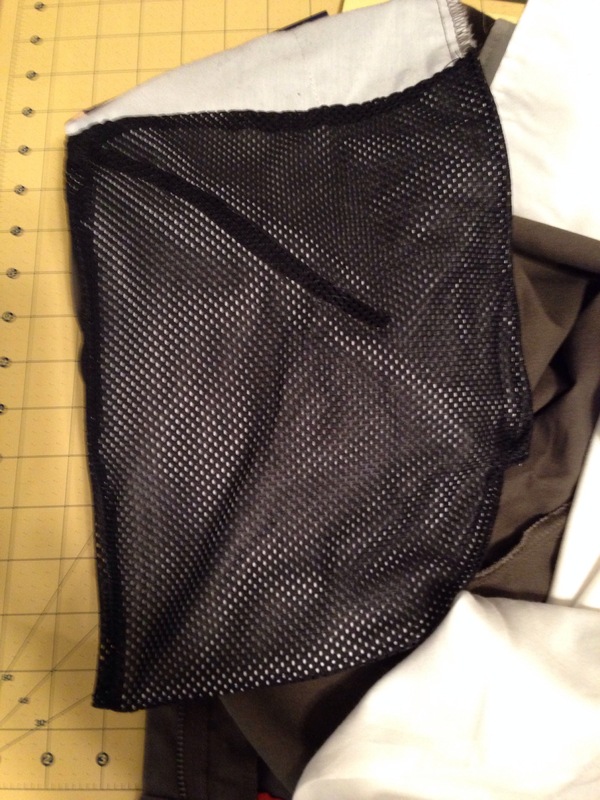 You can see the zipper through the mesh. Give this a try. It’s cheap and easy, and could save you a lot of pain. You can get into your pockets but it’s pretty difficult for a pickpocket. As a Valentine’s Day special, Avignon University and the Avignon Opera had a real treat for us today. 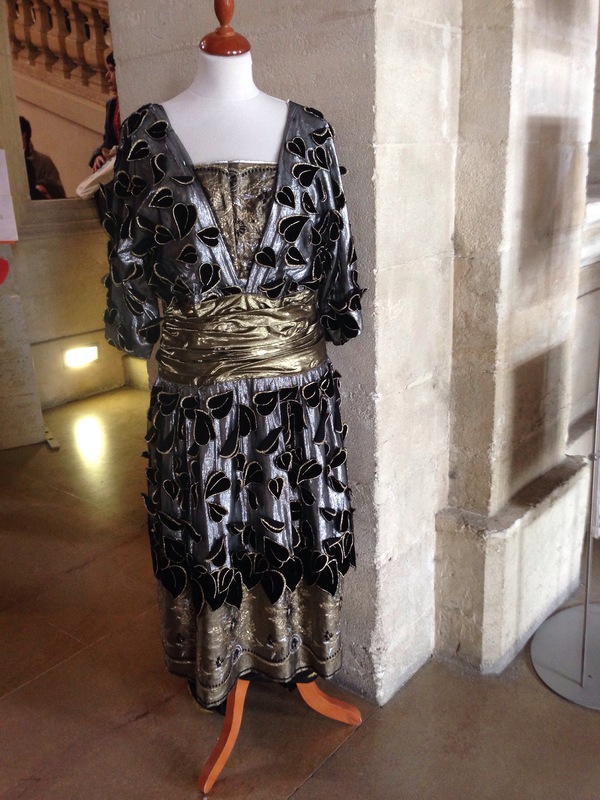 Members of the Avignon Opera performed a selection of songs from “My Fair Lady”. Of course they sang in French but that made no difference because we were familiar with the music. What a wonderful way to promote the Opera, though I’m not sure how necessary that is in a city that already had a vibrant “arts” community. In fact there’s a theatre around nearly every corner. 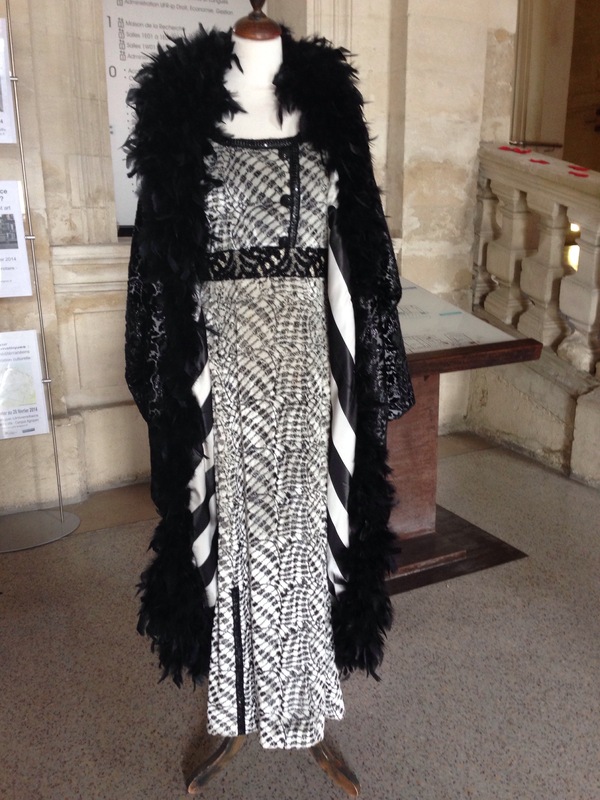 While the performers were not in costume for this noontime performance, they did have some of the costumes from a recent production of “My Fair Lady” on display. As you can see below, they are gorgeous. Wish I could post a short video clip, but WordPress and mobile devices are not a very good combo, so you’ll need to settle for some eye candy. course including Paris) and Belgium for several weeks, we settled in to our apartment in Avignon. In Provence, life is pretty laid back. Not that life as a retiree is all that rough anyway, but it feels good to be in a perfectly paced environment to hang out for several months. Our apartment, which we rented through VRBO is in the heart of the old town, and this is the view from our apartment. It’s one of the towers of the Palace of the Pope, which is the 13th Century home of the Pope. The apartment is on a narrow street with barely enough room for a car much less a pedestrian alongside the car. 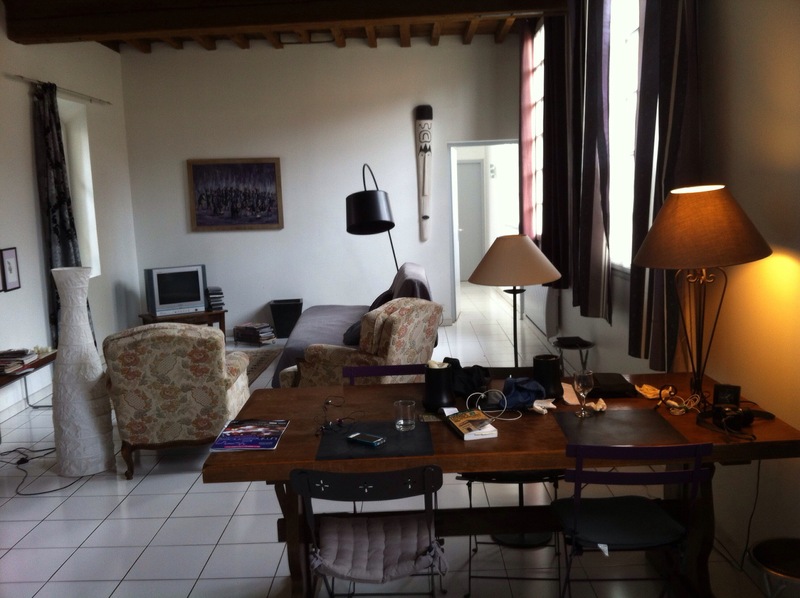 It’s in a very, very old mansion that has been divided into apartments. Ours is on the third floor – 44 steps to be exact. 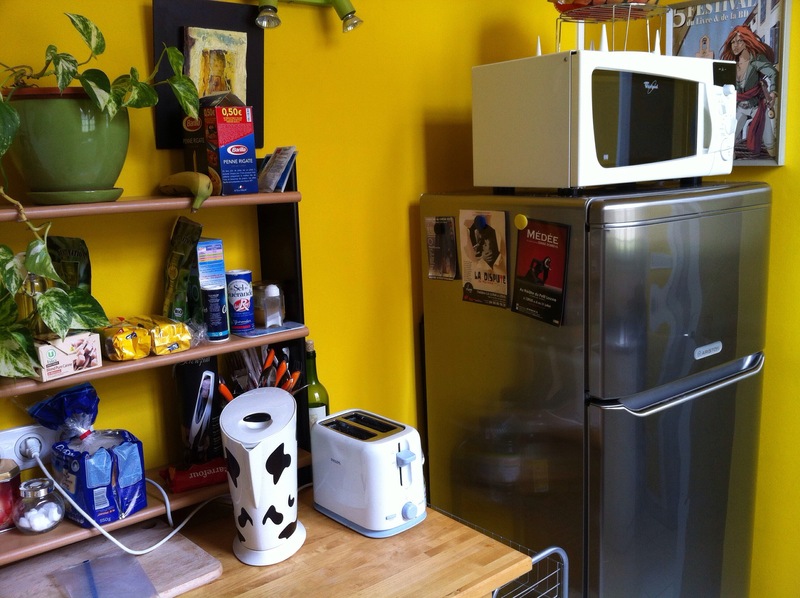 Here are several photos of the inside, which has a huge living area, kitchen, bath and two bedrooms (one with a loft). Soon we’ll need all that space as we have a number of guests in the coming weeks. Daily, we go to the market to buy fresh ingredients – it’s so easy to make great food when the fruits, vegetables and meat are so fresh. So while I can’t sew, I am cooking and baking a lot; also reading or listening to audio books and knitting. That’s it for now. Maybe I’ll actually find a fabric store to blog about. Usually when we travel, I spare Kevin the agony of visiting textile or fabric shops, but this trip is so long that I wouldn’t be able to bear 10 weeks without looking at and drooling over fabric. So when we visited Sacre Cour (Montmartre) in Paris, and stumbled upon Martre St. Pierre, I sent Kevin sightseeing on his own for a while. That might be a white lie – I had checked with my friend Mimi to find out how to trip over tables of inexpensive fabric. So what did I find? 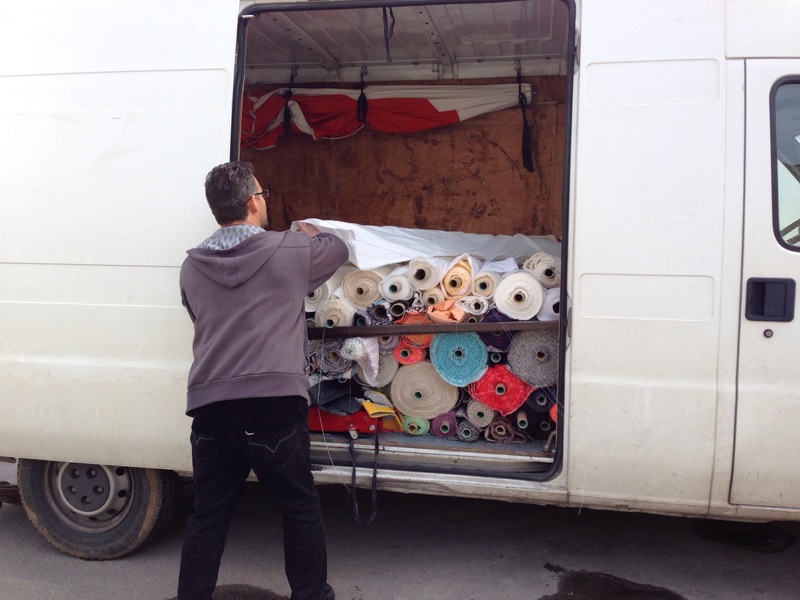 As you can see, there were rolls and rolls of fabric bins of 3 meter cuts. For anyone who likes to bin-dive, this was the place to be. Generally fabric rolls were sorted by fabric type, but not the bins. It was random ‘find an interesting corner, pull and tug” type of shopping. The fabric stores lined the street with mounds of fabric inside and out. Thankfully it wasn’t raining the day we were there but it was windy and cold. 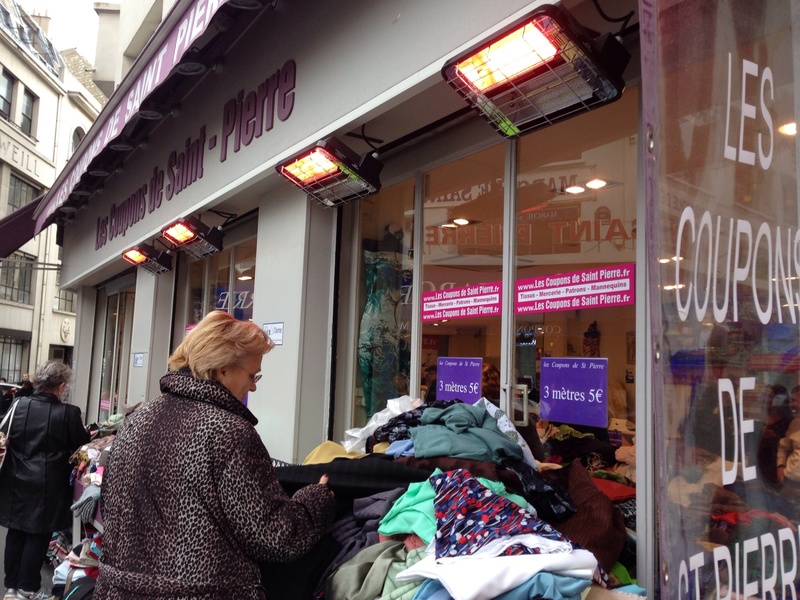 loved the overhead heaters one store provided to keep interested shoppers picking through bins. What I liked the most was that the stores were full of creative ideas. 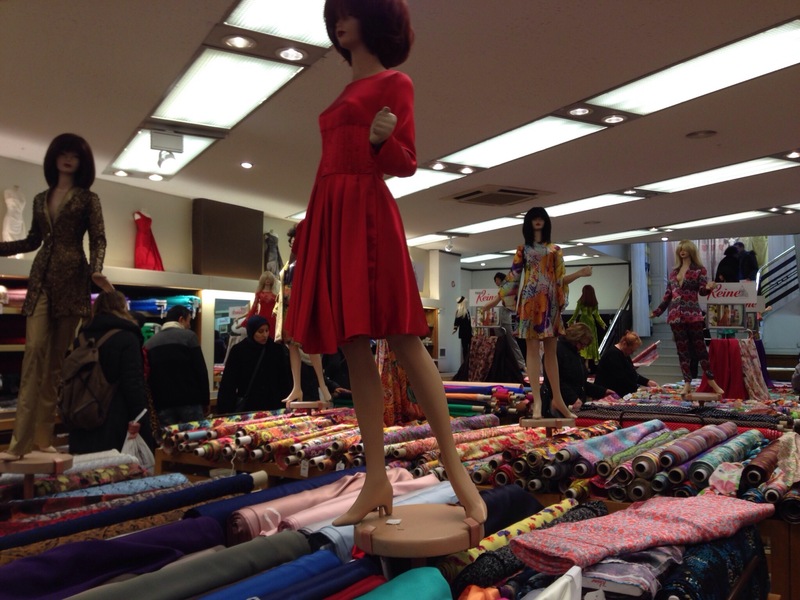 One store had miniature models wearing outfits – about 20 of them. Next I liked watching people search for fabric with a sketch in hand. Probably saw a dozen or more. I can’t think of a better place to match fabric with a creative design. Can you guess what I bought? Nothing – nada. Not because there wasn’t fabric to love, but because we are carrying backpacks and mine was full. 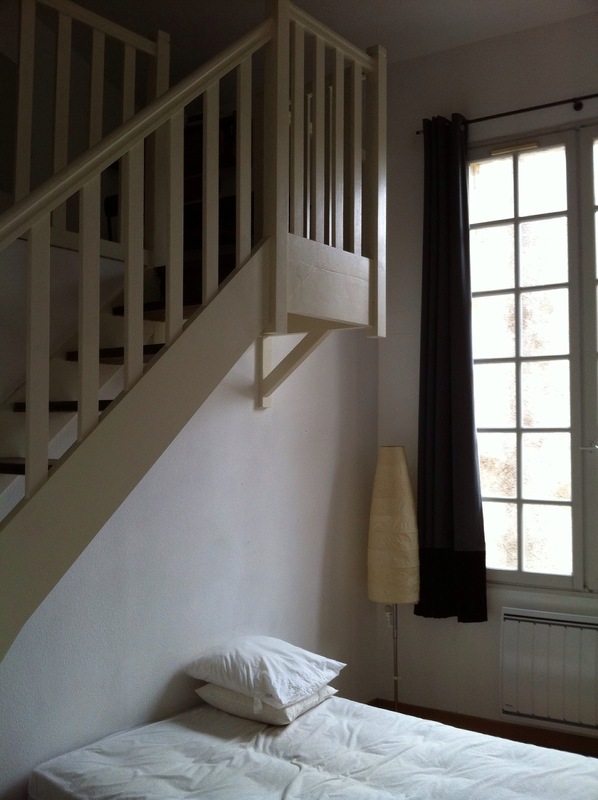 That doesn’t mean however that I won’t accumulate fabric now that we are settled into an apartment in Avignon for several months. 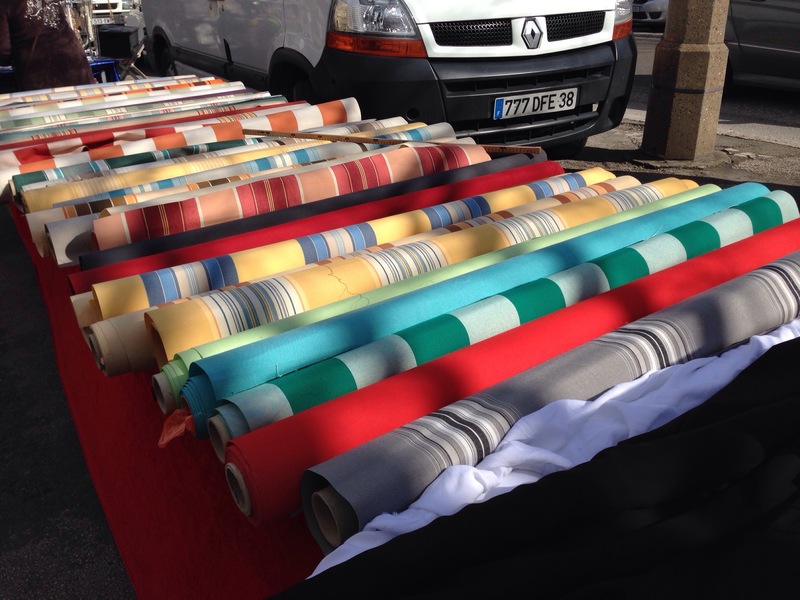 In fact, if you know of great fabric stores in the south of France, please let me know. Before this week, I naively admit that I’ve never heard of Rouen, France (north of Paris near Normandy). But now that I’ve been there are really more than 3 reasons to visit this beautiful city; to see the fabulous Rouen Cathedral,to see where Joan of Arc was burned at the stake or to walk through the old town, which is where we stayed. 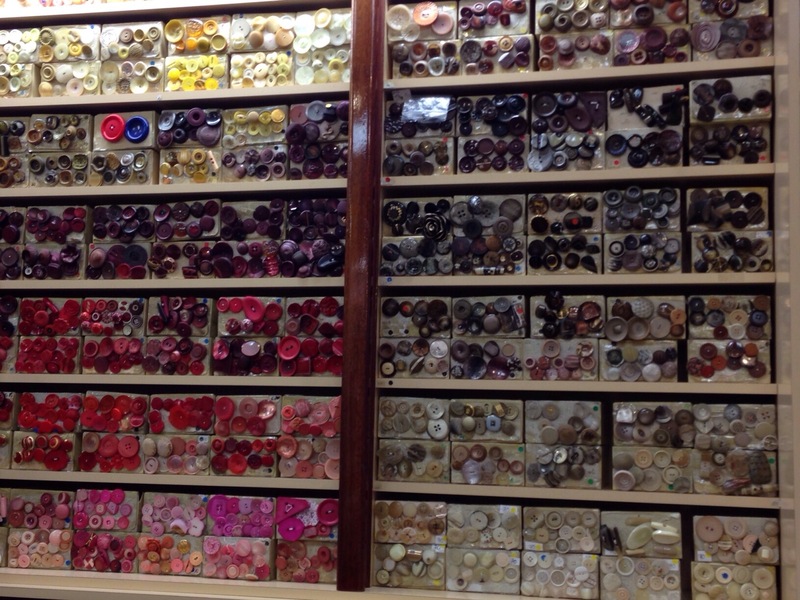 Amazingly, there are two yarn stores and a huge button store within several blocks of each other. 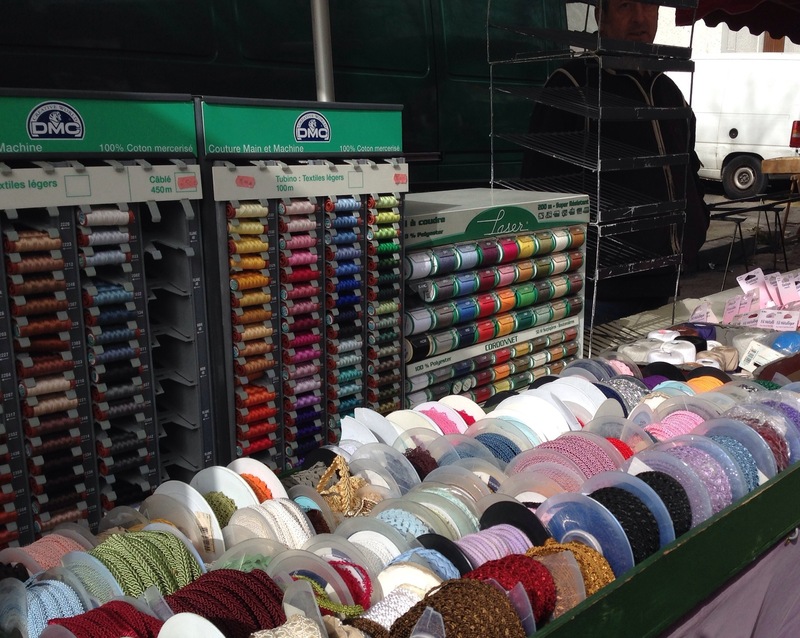 This is sewing and knitting heaven. 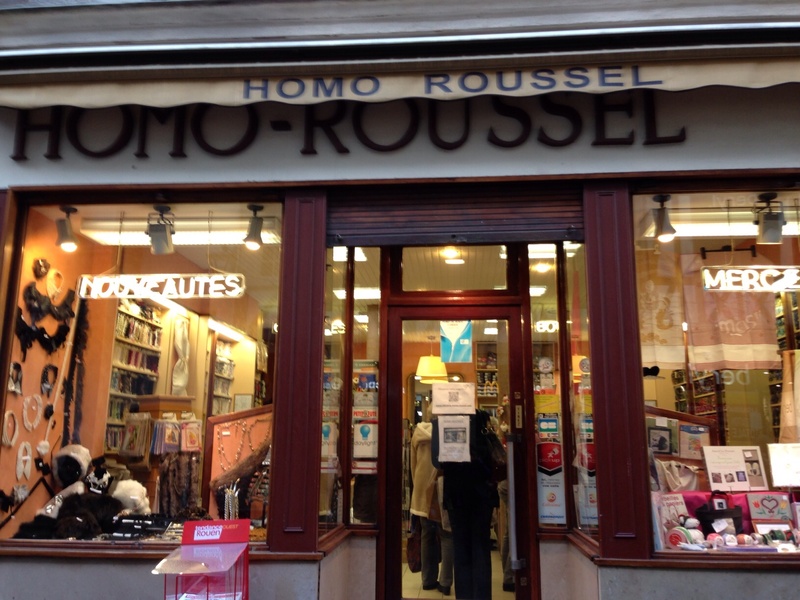 this tiny store is up the street from the Joan of Arc Memorial as you go toward the Cathedral. It has an entire wall of buttons. It’s admirers were just about lining up to get in the store. In particular, two women were there with winter coats with a missing button? my bet is that they found one to match. 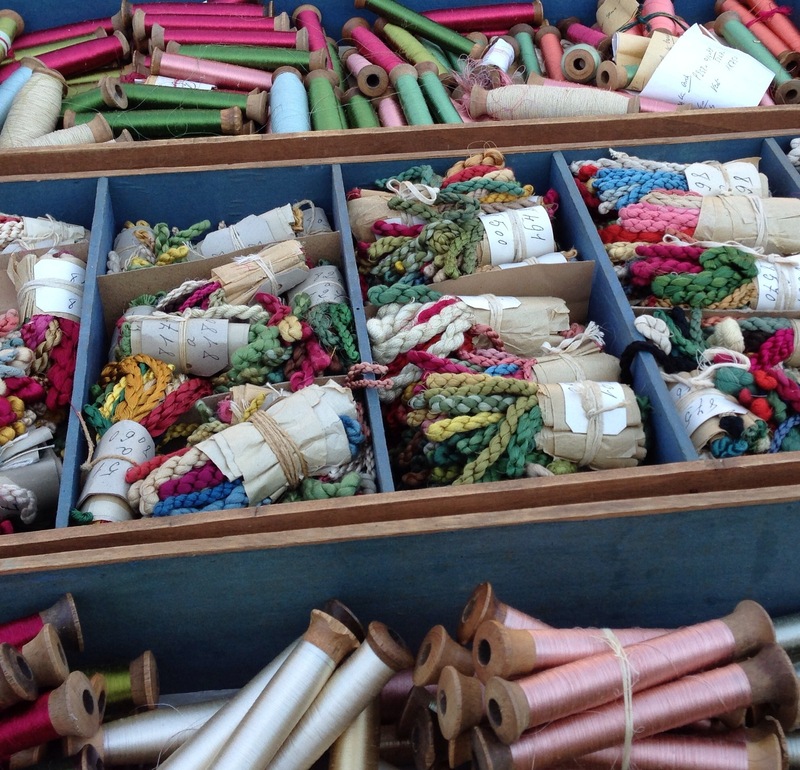 In addition there is a small amount of yarn, some cottons and lots do sewing notions. Oh how I wish this store could be in my neighborhood. 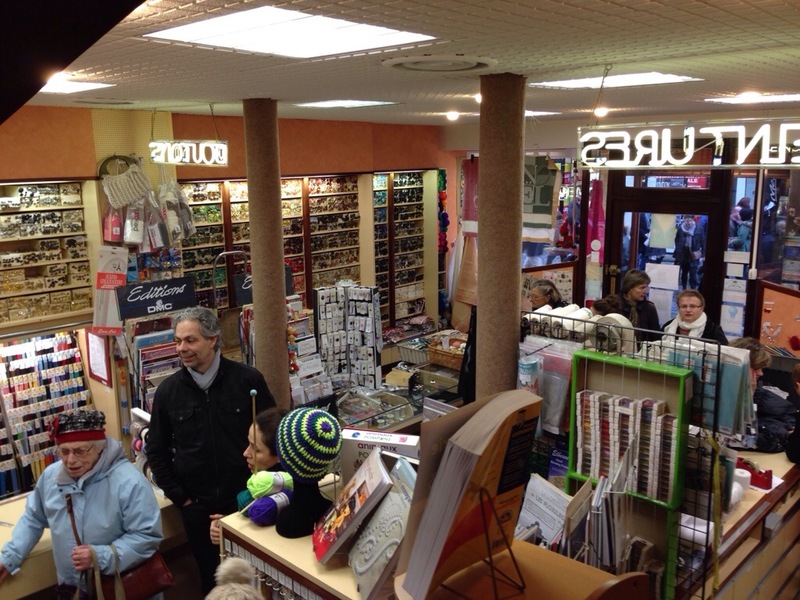 In addition there were two knitting store – one a Phildar store and another with a number of brands. Several days ago we were in Bruges. Not only is it a beautiful medieval city, I learned that at one time this city was the center of the European cloth industry. 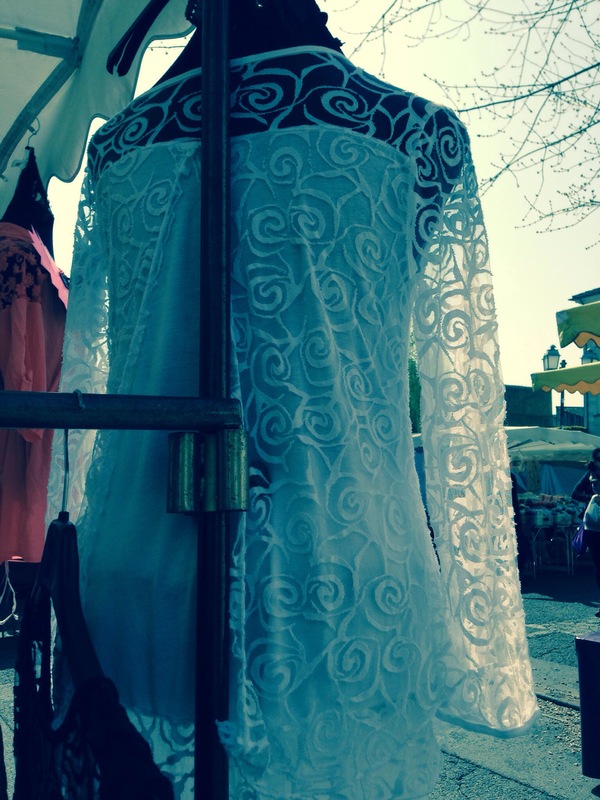 An outgrowth of that industry was the art of making lace. Unfortunately this art form is hanging on by a thread. 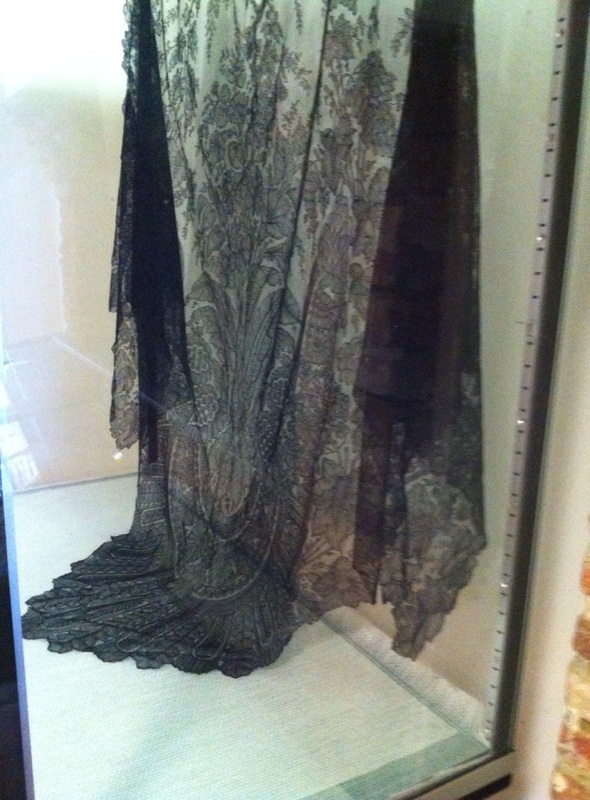 However at the Lace Museum in Bruges There are a handful of women trying to keep lace-making alive. 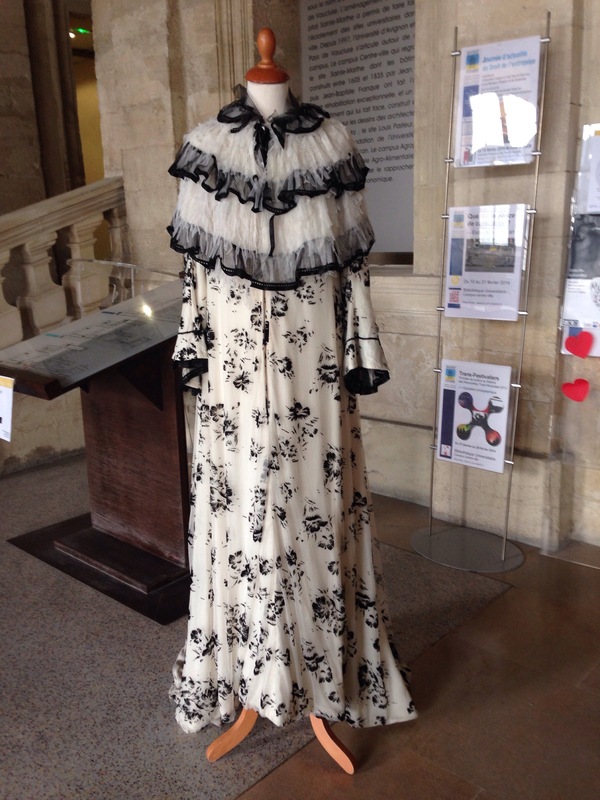 They have a display of exquisite pieces of lace, provide lessons and demo for visitors. 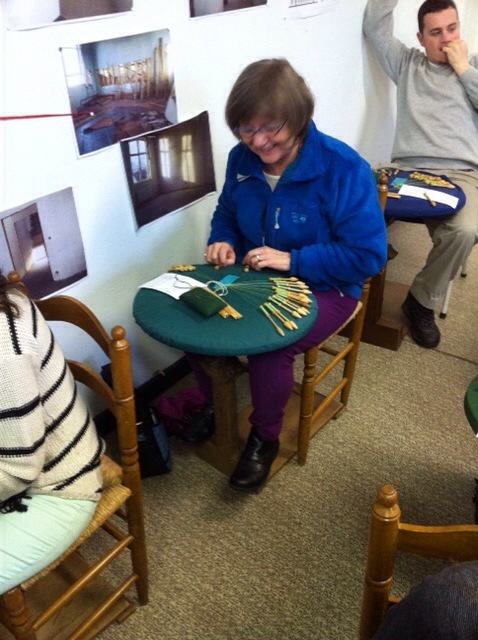 During our visit there were about 20 students from North Carolina who learned basic lace-making, and I was able to sit in with them for a one hour lesson. Wisely, their college professor/tour guide thought it would be good for this group of technology-competent students to learn traditional lace-making. All we did was a 4-thread weave, hardly lace. As with any group, some learned very quickly and others struggled. I was at the midpoint on the learning curve. 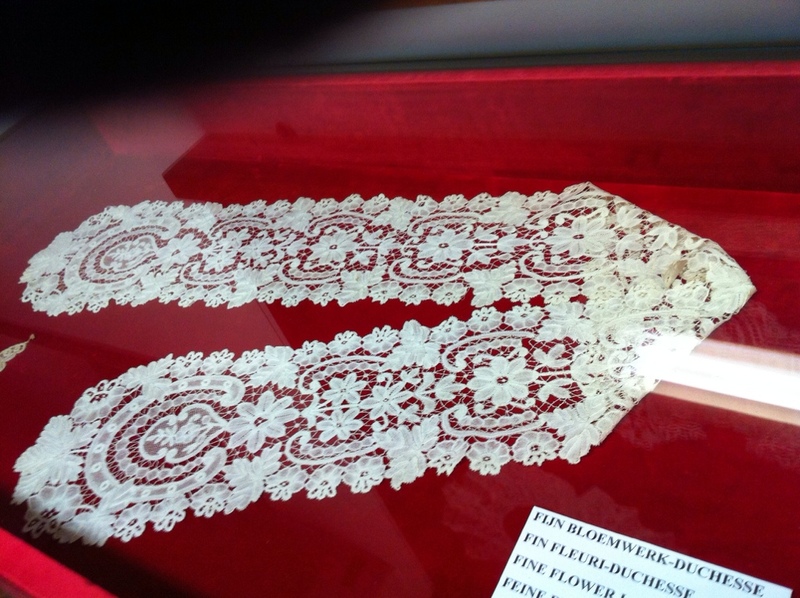 As you can see, here some photos of the gorgeous pieces in the museum, and a pix of me fumbling around trying to learn to make lace.